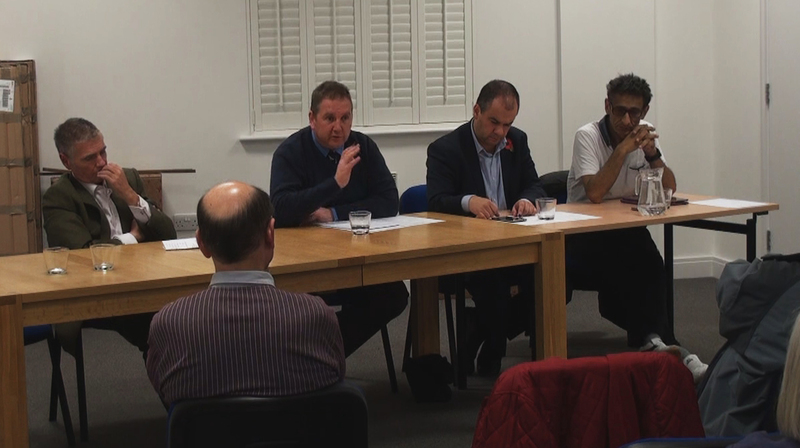 Worcester Park Residents' Association: Report on Extraordinary Police ward panel meeting. Report on Extraordinary Police ward panel meeting. and Cllr Paul Wingfield addressing the meeting. On Friday the 30th October an extraordinary Police Ward Panel Meeting was called to discuss the possible savings needing to be found from the police budget and the effects this might have on local Neighbourhood policing in Worcester Park. It was also attended by Steve O'Connell, our London Assembly member and Paul Scully, our local MP, both of whom spoke expansively and were able to provide some insight. Steve O'Connell, being our representative to the London Mayor, told the meeting that "Boris would never simply sit back and allow the successful neighbourhood policing in London to simply be taken away." Paul Scully promised that he would talk to the chancellor George Osborne about the issue and do all he could to safeguard our great local police here in Worcester Park. The meeting resolved with everyone in agreement that the Chair, Simon Densley should write to Sir Bernard Hogan-Howe to express the views of the meeting and ask that the existing policing situation in Worcester Park be retained. As chair of the Police Safer Neighbourhood Team Ward Panel in Worcester Park, London Borough of Sutton, I recently called an extraordinary ward panel public meeting (Friday 30th October) to discuss concerns about possible changes to local policing in the face of reportedly expected budget cuts. This was attended by Paul Scully MP and Steve O'Connell AM. There are two things that came out of this meeting which I would like to make you aware of, plus the outcomes we would like to see locally. First, the general conclusions drawn about what is going on was seen clearly as a negotiation in public with the opening position being every possibility on the table including the unpalatable ones. We can see that the recent ominous headlines are a result of political game-playing by the Met and the politicians. Essentially the pitch to the politicians is ‘make any more cuts and we’ll destroy your showcase policing policy and blame you’. Regardless of the rights and wrongs of the situation, the main losers will be us, the public. We note also that the HMIC has criticised the police in general for expensive budget failures. Poor planning on future staffing, wasteful computer systems and a paranoid fear of the private sector. We accept that money needs to be saved and these failures should be addressed before taking the axe to PCSO’s and the success of Neighbourhood Policing. At the same time we asked our MP Paul Scully to raise our concerns with the Chancellor George Osborne to ensure that the police budget allows our Neighbourhood Policing system to continue in as unchanged a state as possible. Second and more importantly, our existing Neighbourhood Policing setup in Worcester Park is an example of why it is so important not to lose our Neighbourhood Policing system. Gary Weaving is our own dedicated PCSO in Worcester Park ward. Gary is well known in the local area and provides a valuable bridge between the police and the community. He knows the area well, he knows who the local trouble makers are, and he knows who the local vulnerable people are. He is always friendly and approachable and has a rapport with the local traders in the high street as well as local residents. We believe his understanding of the local community is a source of invaluable intelligence which has been instrumental in helping bring and keep crime down in Worcester Park. Additionally in 2013 Gary received a Met Police ‘environmental efficiency’ commendation award for his leading role in creating the ‘fishery’ in the wetland area of 'The Hamptons' part of the ward, something he did in his own time for the local community he wishes to serve. It would not only be a terrible loss to our local community to lose PCSO Gary Weaving, that loss would be hugely disproportionate to any financial gain from such a change. I have no doubt that the majority of London Borough wards have similar stories to tell and that our dedicated ward officers and PCSOs have proven themselves to be both an effective and efficient tool in reducing crime locally. In light of recent events in France, I would also argue that such officers are our intelligence foot soldiers and that without them, a vital source of information for our security services would be cut off. As the Worcester Park ward panel we are resolved to ask as the highest priority, the retention of Gary Weaving as our dedicated ward PCSO. We would also ask that our current system of Neighbourhood Policing remain unchanged and lastly the retention of our Police Office at 154 Central Road, Worcester Park, KT4 8HH. I look forward to a positive resolution to this current set of negotiations, which will see both sides take a sensible position bringing both the necessary financial benefits while retaining the effective and efficient aspects of Neighbourhood Policing. WPRA. Simple theme. Powered by Blogger.